- Premium 3 in 1 wash mitt. - Super plushmicro-chenille and microfiber backside. 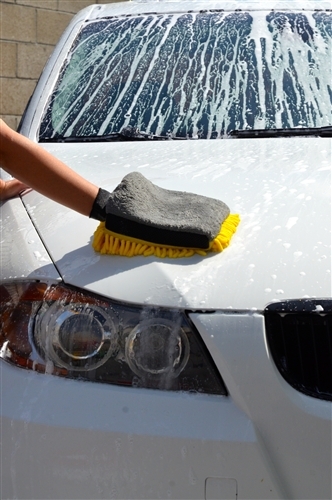 The most fundamental step before any detailing is washing and cleaning the vehicle’s surface from dirt, debris, bugs, and road grime. Chemical Guys 3-Way Premium Wash Mitt takes washing the vehicle to a whole new level! The 3-Way Premium Wash Mitt is a perfect washing medium because it’s a combination of super plush micro-chenille wash mitt, mesh bug sponge, and an ultra-plush microfiber backside. Three is better than one! This premium wash mitt’s plush micro-chenille pampers the paintwork and holds on to all the soapy suds from the wash bucket for a safe, swirl-free wash. The superior micro-chenille noodles safely lift and trap the loosened dirt & debris deep into the strands rather than being rubbed against the exterior paintwork causing scratches and swirls. The side mesh bug sponge provides extra scrubbing power for the annoying bug guts and the nasty road tar. 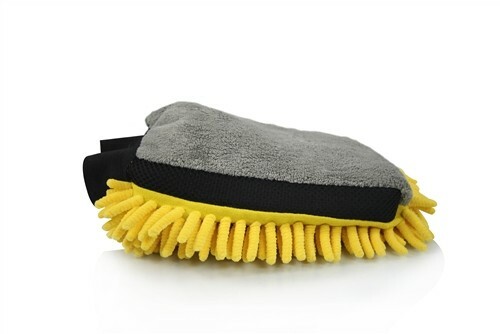 On the backside of the premium 3-Way Wash Mitt you will discover a side of ultra-plush microfiber for the really tough dirt and grimethat needs the extra scrubbing power more than the micro-chenille in the front. The Chemical Guys 3-Way Premium Wash Mitt offers the convenience of everything being integrated into one mitt. Don’t ever let a bit of bug and tar take the joy of washing your car away from you using the 3-Way Premium Wash Mitt. Wash with Chemical Guys Microfiber Wash.